Looks like Excalibur is getting remade. Interesting. I'll be watching this with interest. Excalibur is one of my favorite movies of all time. One summer back in the early 80's I watched it every single day. One of my absolute favorite movies - I still watch it a few times a year. Jump started the career of a couple of big names. I hope they do it justice with a newer version. Still, I am kind of funny about classics getting redone. I'll hope they get it right. This is the movie that got me in to all this in the first place. I was reading Tolkien and my Aunt took me to see it. This movie holds a special place in my heart. While I'll most likely go see it, and I do hope they do it justice, I just wish they'd stop toying with classic movies and maybe come up with an original idea. I'm a little tired of remakes whatever the movie. With that though let's hope they do a good job with this one. I did a little bit of reading and rewatched Excalibur today. For the life of me, I cannot spot Ciarán Hinds in the movie. He is supposed to appear as the character, Lot, but it's really not clear who this is in the film. I admired Ciarán's portrayal as Julius Caesar in HBOs Rome, but I am still unable to identifiy his character in Excalibur. Anyone spot him in Excalibur? Post a still if you do! Of all the things they could do they can't find anything more interesting than another arthurian rehash? In spite of being a medievalist and an arthurophile I find the prospect totally unappealing. Yawn. Cairan Hind's character is, I think ,seen mainly early on, just before Arhtur pulls the sword from the stone. If you look at the fight / tournament part just prior to that bit you may see a character with a full beard who is Mr Hinds. I think he may also sport a topknot as well. He doesn't have a large part in the film as I recall. 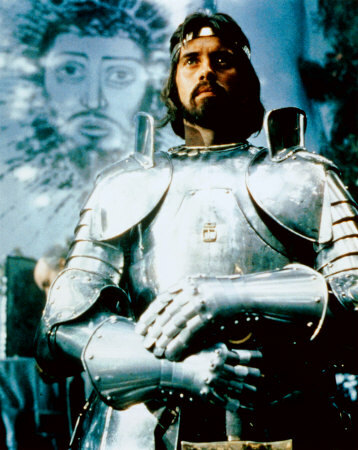 Excaliber is one to the most beautiful movies that I have ever seen, and John Boorman is a gifted director when it comes to things mythic. It will be damn hard, maybe impossible to do better. Why and how remake Excaliber? Why doesnt Singer just do his own version of the Arthurian legend? I first saw Excalibur when it came out in the early 80's. I was only 10. It was my favorite film for about 9 years and led me to start my sword collection. Needles to say, Excalibur totally changed my life. Brian Singer is an absolute genius. I can't wait to see what he will create with this script ! Wonder if we will get 6th century Arthur accurately portrayed, 15th century Arthur the Walt Disney type like " First Knight " or a totally " Fantasy Version " ? Each has it's " charms " if well done and not trying to be something else i.e. marketed as history while not being historical at all ? As a " Legendary Story " there is some room for poetic licence. Besides, who honestly wants to see Lancelot du Lac carrying a spatha and wearing a hauberk and not armed with a lance while wearing a nice, new shining 16th C plate harness? I don't have a DVD player but like someone else stated, in the scene where Patrick Stewart's character is trying to pull the sword from the stone he is on a horse, next to Urian (sp?). He doesn't have a topknot though. Also, in the scene where Sir Gawain (Liam Neeson) accuses Guinevere, Hinds is sitting right next to him with Morgana standing between them. Bryan Singer is a pretty good director, and given the rather stylized nature of the original "Excalibur" I think there's a lot of room to do things differently. It seems more likely that a director could do a their own version of La morte de Arthur than a remake of another directors version of La Morte de Arthur. Since it comes down to aesthetic choices of production. Boormans movie was brilliant and I think a masterpiece. He had been influenced by the Arthurian legends all his life and really came thru with this film. I really liked how he combined so many visions in one movie. I really liked his choice of armor. Big, late period suits of plate is a very archetypal image to most people when they think of "medieval" or "Knight". I also liked how in the beginning all the warriors wear dark burnished metal with the helms fashioned after the visages of beasts. It was supposed to represent mans "lower", "beast-like natures". It was an incredible mix of pagan and christian imagery. And of course the great Will Hobbs did the fight choreography. I dont see the point of re-making it, Better for Singer to do his own movie. I suppose though that "Excalibur" as a title has a lot of cache'. I finally managed to get the soundtrack on CD from a little company. It has the classical Wagner music and the original film score straight from the movie. The first real sword I ever owned was a commission piece that was modeled after Excalibur. The only difference was that I had a white bone grip put in, instead of the chain wrapped one and I had a red copper pommel with the distinctive crosshatching. ARTHUR AND THE LAND ARE ONE!" I totally agree. Unlike indy films, Hollywood's primary concern is to generate income. That being said however, Bryan Singer is an excellent director and I don't think that he will accept to simply make a straight forward "remake" of Boorman's film. One challenger Singer will have to tackle is the elaborate costumes and decor in the original. Boorman's use of plated armor (albeit made of fiber glass) were visually stunning, even in the backdrop of today's standards. Excalibur has such a cult following, I don't think that Bryan will simply remake the film with mild changes. Greater emphasis will be placed on battle scenes, decor, costumes, let alone the basic stript. I'm really looking forward in seeing the film. Id love to see Gabriel Byrne play a part in this version. I think another challange would be to match or excell the amazing lighting that John Boorman used in the film. He used high intensity green lighting on the natural green forest (on his own property) to make the lush irish woods a verdant magical kind of Green. I'm probably a minority in this, but I thought the original Excalibur was almost hilariously bad. Then again, I first saw it pretty late in my life so it didn't have any nostalgic value to me. I don't mind another Arthur movie, I just hope they manage to make a really good one this time. I haven't seen a single King Arthur film I thought held good quality. I'm hoping for a "highly romanticized non-specific medieval times" sort of thing, because when I think King Arthur I think knights in shining armor. I expect they do that stuff digitally these days. Honestly, I don't think modern Hollywood would find any "challenge" in recreating something they made thirty years ago. The only question is whether they want to or not. Don't forget the version done in space... http://www.imdb.com/title/tt0076759/ *Grin* There's nothing new under the sun.